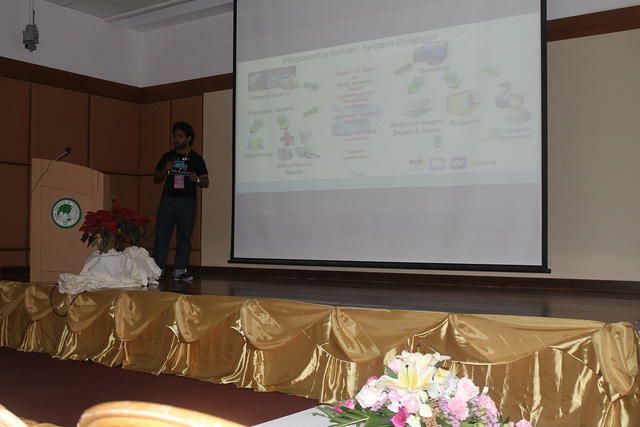 It is great pleasure to inform that group of SLIIT undergraduate students have done a presentation at FOSS4G-Asia 2014 conference which was held at Bangkok, Thailand, 2-5 December 2014. The presentation “Geo-enabled FOSS Tool to find Impacts on Roads following a Flood Disaster” was based on their final year project. The project developed a plug-in to support road impact assessment, path planning and medical requirement analysis after a flood disaster for QGIS open source GIS software. The project was initiated by the Geo-informatics research group of SLIIT with OSGeo Lab. The team was led by Kasun Sampath Ramanayake and other members were Dilma Vithanage, Nisansala Hettiarachchi and Givanthika Rathnayaka. The project was supervised by Nimalika Fernando and co-supervised by Samantha Rajapakse.